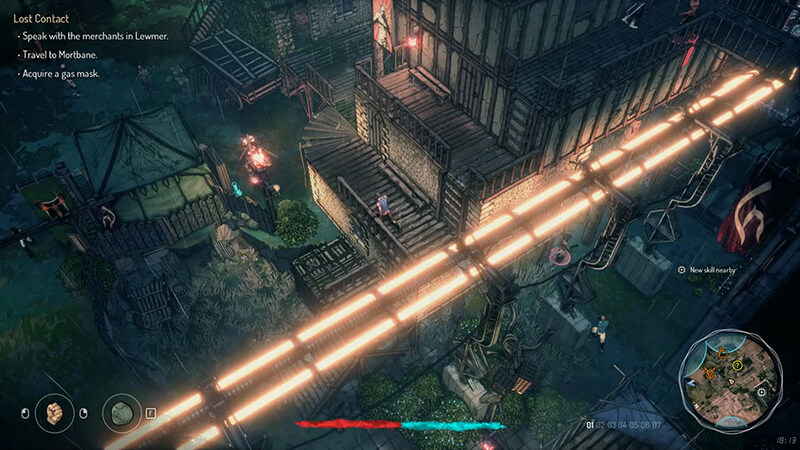 Seven: The Days Long Gone is an isometric stealth action RPG that, in its ambition at becoming a jack of all trades open world adventure, falls far from its potential. Stealth action RPG sounds like a contradiction in terms — ARPGs such as Diablo and Path of Exile place emphasis on gratuitously blowing enemies up with aggressive combat and screens full of explosive magic, yet Seven demands you play stealth by putting you squarely in the boots of an underpowered, realistic human rather than a walking avatar of destruction. It’s an unusual play, and unfortunately it doesn’t really pay off. Seven drops you into the boots of professional thief Teriel, a gruff and rugged survivor trying to make the best of things in a dystopian world of steam and scavenging. After a heist goes horribly wrong, Teriel is semi-possessed by a demon and dragged to the sprawling prison island of Pey, where you’ll be spending most of your time in a painfully hostile open world being torn apart by rival gang factions and a generally uncaring guard populace. 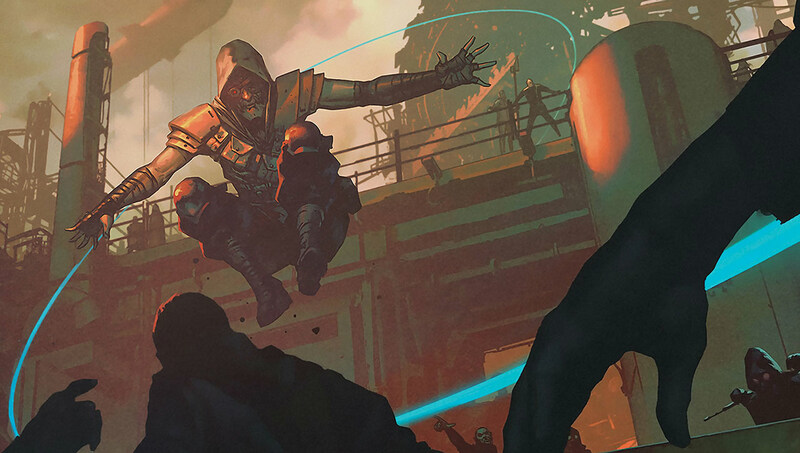 Seven: The Days Long Gone lets you know early on that there’ll be little teaching or easing into the game beyond the tutorial-esque heist; much of the game’s intricacies, from the crafting to the various consequences of your actions (and inaction) towards encounters and situtations you’ll continue to stumble into as you explore the island. If you’re a fan of doing things your own way, Seven can be quite appealing, as it makes few assumptions about how you’ll approach particular quests or whether you’ll even bother with certain areas and characters, and you’ll often have the choice of whether to inform a person about important information or keeping a fetched reward for yourself — all of which having their own unique consequences later on. The steampunk world of Seven is fairly well designed, with a solid narrative and interesting background that is unfortunately marred by poor voice acting, making much of the incidental dialog tiresome to listen to. It’s a shame, as there is plenty of lore tucked away and an array of quirky characters to meet if you’re willing to slog through — wild mages, technomancers, and biomancers all have their own agendas and questionable methods of acting upon the world around them. The core expected gameplay loops of exploring the island, stealing goodies and growing strength all turn out to be wearisome, too. There’s an overwhelming amount of doodads that can be pilfered, but most of them are literal trash and simply waste inventory space — something you have very little of. 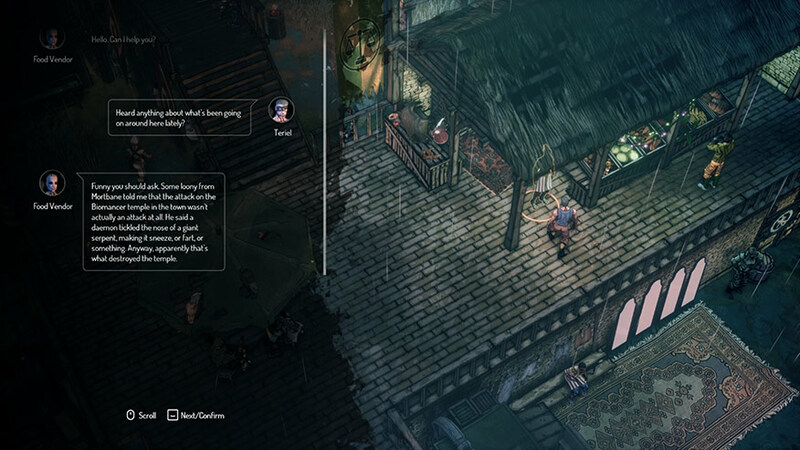 Crafting new weapons, gadgets and equipment is a laborious process requiring difficult to find parts, and looting is a slow process that all too often draws the ire of nearby NPCs, virtually guaranteeing your death and a trip back to the last checkpoint. Even movement feels slow, with Teriel moving at a sluggish pace and struggling with the island’s focus on verticality across many of its towns and forts. It also leads to it being a little too easy to roll an inch too far, falling to your death and, yes, back to the last checkpoint. You’ll be dying a lot. 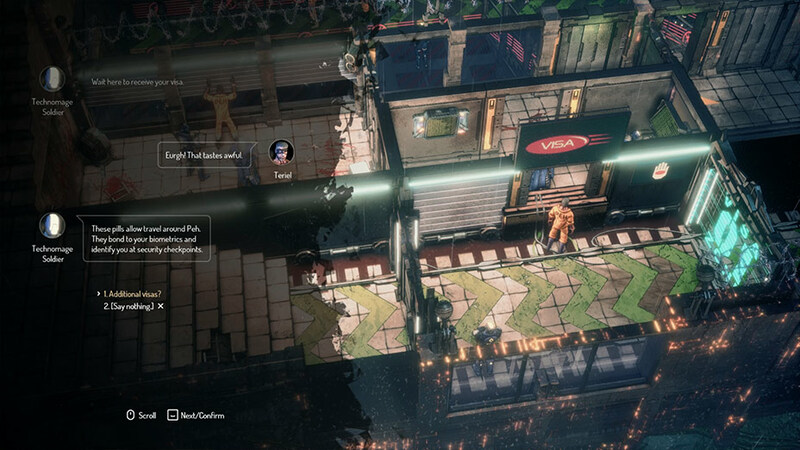 It’s unclear whether Seven was rushed to meet a particular launch deadline, but bugs, missing cues and checkpoints, and textual errors propagate your playthrough. Early on you’re clued to use sense mode as a way of moving forward, but the game — which until this point has correctly taught all the different moves and abilities available to you — fails to ever explain what sense mode is or, more importantly, how to actually trigger and use it. It wasn’t until a few frustrating deaths later that I dug my way through the options menus and found the key for it myself, and once available the scenario finally became manageable. Another experience was that, once I arrived on the island of Peh, I soon died from exploring (and, admittedly, being silly) and falling off of a cliff. Imagine my surprise then, as I was sent back to a checkpoint in the previous chapter of the game. In fact, frustration is a feeling that permeates the entire game experience. Taking on more than one (or two, if you’re lucky) opponents at a time will generally result in your death. Doing something remotely aggravating near other prisoners will make them chase you down and pummel you into pulp, and even if you do manage to escape them the local guards will likely take notice and quickly gun you down. The realtime action approach that Seven uses just doesn’t really feel like it belongs. Stealth games use predictable patrols and reactions which can be exploited, whereas Seven‘s NPCs can wander and can’t easily be picked off individually as you’d expect. I’d much rather the game had used a turn based combat system à la Shadowrun, where combat flows well and makes more sense than trying to sneak up to an enemy, be spotted by three nearby guards, and quickly annihilated.